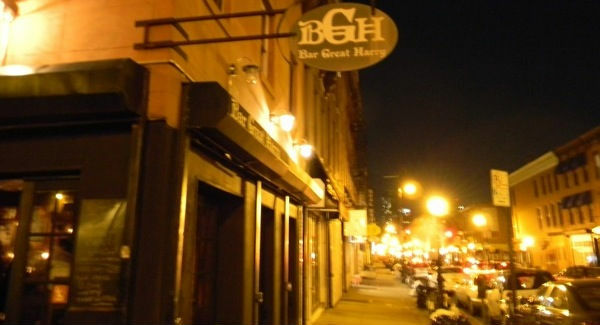 For a Tuesday night, Bar Great Harry was pretty hopping. The combination of a short holiday week (Thanksgiving), the high percentage of Sixpoint brews on tap for “The Brothers Wiley Rock Sixpoint” and a dog-friendly, comfortable, neighborhood bar in Carroll Gardens drew quite the crowd. Typically, when I arrive at a bar by myself, I come equipped with some sort of reading material. But, even with the street lights peeking in through the door right next to my table, I couldn’t read a word. It didn’t matter; I’d ordered my Sixpoint Missionary IPA, a hoppy yet drinkable quaff and both Brew York, New York and I Drunk That were on their way to meet me. 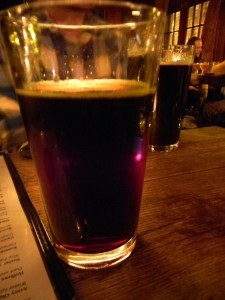 The highlight of the night on tap was certainly the Oyster Stout, a smoky and flavor yet light-for-a-stout brew. On the other hand, I was underwhelmed by the Signal, a brew with a bitter hint of grapefruit. Although I might be in the minority when it comes to Signal as Brew York, New York and several of our Sixpoint friends praised the beer repeatedly. We also had the opportunity to sip a few beers with Sixpoint’s own Shane Welch, Cathy Erway of Not Eating Out in New York and a few of Shane’s Sixpoint colleagues. The group opened us a bottle of a very grassy, earthy brew to share with us. This bottled brew featured a label adorned with a cartoon woman in traditional (but revealing) German dress. While the outside might give you an Oktoberfest impression, the rest of the beer is all American. The night ended on a good note with friends, a Belgian IPA and lots of dog cuddles.